We're making it even easier to upgrade your rifle in one step. 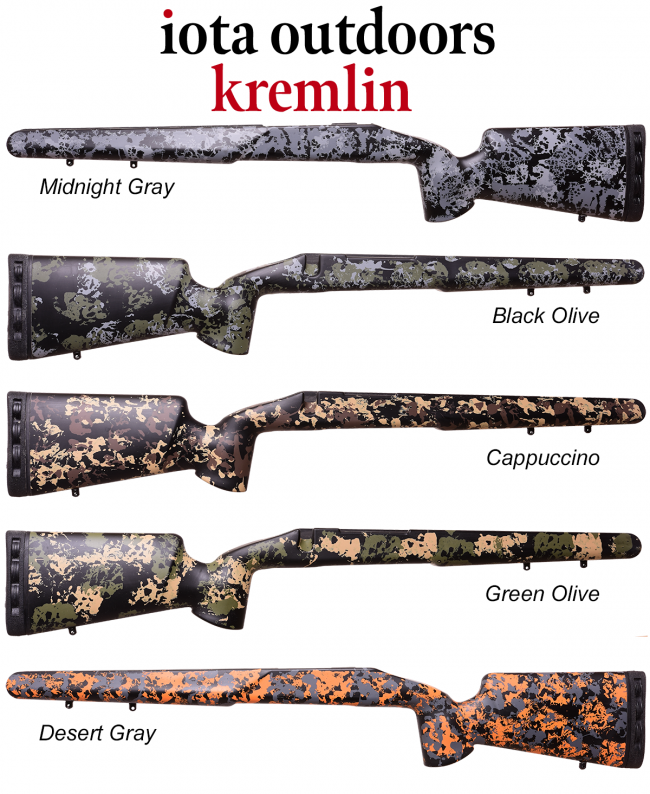 This package deal includes the Iota Outdoors Kremlin stock in long and short action in your choice of color and a Proof Research Carbon Fiber barrel blank in your choice of caliber. The KREMLIN is a composite rifle stock that combines key features from both hunting and target stock designs, creating one multifunctional precision stock for a wide range of experiences. Molded-in colors for looks and durability. Composite layup rifle stocks reinforced with a carbon fiber core to achieve superior strength in a lightweight build. Available for a variety of barrel channels and bottom metal configurations. Please note that every stock is hand-mixed and molded, therefore every single stock is unique - color and pattern will vary from stock to stock. Proof Research Carbon Fiber Barrels - Bolt Action Rifles come ready to be chambered and threaded by a gunsmith. Why are we pairing these two items together? We have collaboarted with iota Outdoors to offer our customers a plug and play package. We are offering the Kremlin inlet for the very popular Proof Research Contours. The stocks inlet for the varmint/tactical barrel channel is the inlet you would choose for a Sendero Lite and the M24/Proof Sendero is a drop in for the Proof Research Sendero contours.